GROZDIC, D. , JOVICIC, S. , SUMARAC PAVLOVIC, D. , GALIC, J. , MARKOVIC, B. This article presents an analysis of different cepstral normalization techniques in automatic recognition of whispered and bimodal speech (speech+whisper). In these experiments, conventional GMM-HMM speech recognizer was used as speaker-dependant automatic speech recognition system with special Whi-Spe corpus containing utterance recordings in normally phonated speech and whisper. The following normalization techniques were tested and compared: CMN (Cepstral Mean Normalization), CVN (Cepstral Variance Normalization), MVN (Cepstral Mean and Variance Normalization), CGN (Cepstral Gain Normalization) and quantile-based dynamic normalization techniques such as QCN and QCN-RASTA. The experimental results show to what extent each of these cepstral normalization techniques can improve whisper recognition accuracy in mismatched train/test scenario. The best result is obtained using CMN in combination with inverse filtering which provides an average 39.9 percent improvement in whisper recognition accuracy for all tested speakers. C. Zhang, J. H. L. Hansen, "Analysis and Classification of Speech Mode: Whisper through Shouted," in Proc. 8th Annu. Conf. Int. Speech Commun. Assoc. Interspeech 2007, Antwerp, 2007, pp. 2289-2292. T. Ito, K. Takeda, F. Itakura, "Analysis and recognition of whispered Speech," Speech Communication, vol. 45, pp. 139-152, Feb. 2005. D. T. Grozdic, J. Galic, B. Markovic, S. T. Jovicic, "Application of neural networks in whispered speech recognition," Telfor Journal, vol. 5, pp. 103-106, Nov. 2013. M. E. Ayadi, M. S. Kamel, F. Karray, "Survey on speech emotion recognition: Features, classification schemes and databases," Pattern Recognition, vol. 44, pp. 572-587, Mar. 2011. H. Boril, J. H. L. Hansen, "UT-Scope: Towards LVCSR under Lombard effect induced by varying types and levels of noisy background," in Proc. IEEE Int. Conf. Acoust. Speech Signal, ICASSP, Prague, 2011, pp. 4472-4475. S. Ghaffarzadegan, H. Boril, J. H. L. Hansen, "UT-Vocal Effort II: Analysis and constrained-lexicon recognition of whispered speech," in Proc. IEEE Int. Conf. Acoust. Speech Signal, ICASSP, Florence, Italy, 2014, pp. 2544-2548. A. Mathur, S. M. Reddy, R. M. Hegde, "Significance of parametric spectral ratio methods in detection and recognition of whispered speech." EURASIP J. Adv. Signal Process., pp. 157-177, Dec. 2012. C. Y. Yang, G. Brown, L. Lu, J. Yamagishi, S. King, "Noise-robust whispered speech recognition using a non-audible-murmur microphone with VTS compensation," in Proc. 8th International Symposium on Chinese Spoken Language Processing, ISCSLP, Hong Kong, China, 2012, pp. 220-223. R. W. Morris, "Enhancement and recognition of whispered speech," Ph.D. dissertation, School of Electrical and Computer Engineering, Georgia Institute of Technology, August 2003. D. T. Grozdic, S. T. Jovicic, M. Subotic, "Whispered speech recognition using deep denoising autoencoder," Engineering Applications of Artificial Intelligence, vol. 59, pp. 15-22, Mar. 2017. V. C. Tartter, "What's in a whisper?," Journal of the Acoustical Society of America, vol. 86, 1678-1683, 1989. B. P. Lim, "Computational differences between whispered and non-whispered speech." Ph.D. thesis, University of Illinois at Urbana-Champaign, 2011. D. T. Grozdic, S. T. Jovicic, J. Galic, B. Markovic, "Application of inverse filtering in enhancement of whisper recognition," in Proc. 12th Symp. Neural Netw. Appl. Electr. Eng., NEUREL 2014, Belgrade, 2014, pp. 157-161. B. Markovic, S. T. Jovicic, J. Galic, D. T. Grozdic, "Whispered Speech Database: Design, Processing and Application," in Proc. 16th International Conference, TSD 2013, Pilsen, 2013, pp. 591-598. P. X. Lee, D. Wee, H. Si, Y. Toh, B. P. Lim, N. Chen, B. Ma, V.J. College, "A whispered Mandarin corpus for speech technology applications," in Proc. Annu. Conf. Int. Speech Commun. Assoc., INTERSPEECH, Singapore, 2014, pp. 1598-1602. C. Zhang, J. H. L. Hansen, "Whisper-island detection based on unsupervised segmentation with entropy-based speech feature processing." IEEE Trans. Audio, Speech Lang. Process. 19, 883-894, Aug. 2010. S. T. Jovicic, "Formant feature differences between whispered and voiced sustained vowels," Acta Acust., vol. 84 (4), pp. 739-743, Jul. 1998. 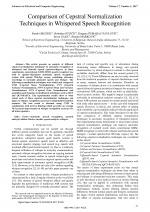 H. Boril, J. H. L. Hansen, "Unsupervised equalization of Lombard effect for speech recognition in noisy adverse environments," IEEE Transactions on Audio, Speech, and Language Processing, vol. 18 (6), pp. 1379-1393, Aug. 2010. B. Atal, "Effectiveness of linear prediction characteristics of the speech wave for automatic speaker identification and verification," J. Acoust. Soc. Am., vol. 55, pp. 1304-1312, 1974. S. J. Hahm, H. Boril, A. Pongtep, J.H.L. Hansen, "Advanced Feature Normalization and Rapid Model Adaptation for Robust In-Vehicle Speech Recognition," in Proc. 6th Biennial Workshop on Digital Signal Processing for In-Vehicle Systems, Seoul, 2013, pp. 14-17. S. Yoshizawa, N. Hayasaka, N. Wada, Y. Miyanaga, "Cepstral gain normalization for noise robust speech recognition," in Proc. IEEE Int. Conf. Acoust. Speech, Signal Process., Montreal, 2004, pp. 209-212. N. P. Solomon, G. N. McCall, M. W. Trosset, W. C. Gray, "Laryngeal configuration and constriction during two types of whispering," Journal of Speech and Hearing Research, vol. 32, pp. 161-174, Mar. 1989. P. Monoson, W. R. Zemlin, "Quantitative study of whisper," Folia Phoniatrica, vol. 36, pp. 53-65, 1984. Citations for references updated on 2019-04-23 04:24 in 74 seconds.